During the mid-1940s, Faulkner reached the pinnacle of his screenwriting career, writing adaptations of the film noir classics To Have and Have Not (1944), based on a novel by Ernest Hemingway, and The Big Sleep (1946), from a novel by Raymond Chandler. Both films were directed by his friend Howard Hawks, and both starred Humphrey Bogart and Lauren Bacall. According to Malcolm Cowley, however, Faulkner considered his best film to be Jean Renoir's The Southerner (1945), which Faulkner worked on for no credit, since to do so would be in violation of his Warner Brothers contract. 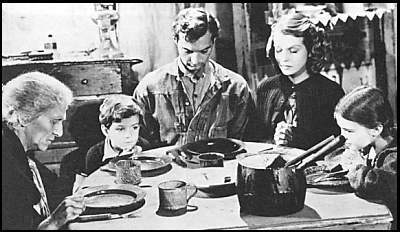 In this scene, Grandma (Beulah Bondi), Sam Tucker (Zachary Scott), Nona Tucker (Better Field), and their malnourished children give thanks for a meal of 'possum. This page has been accessed 2251 times. About this page counter.